Your entryway is beauti-fullty covered. 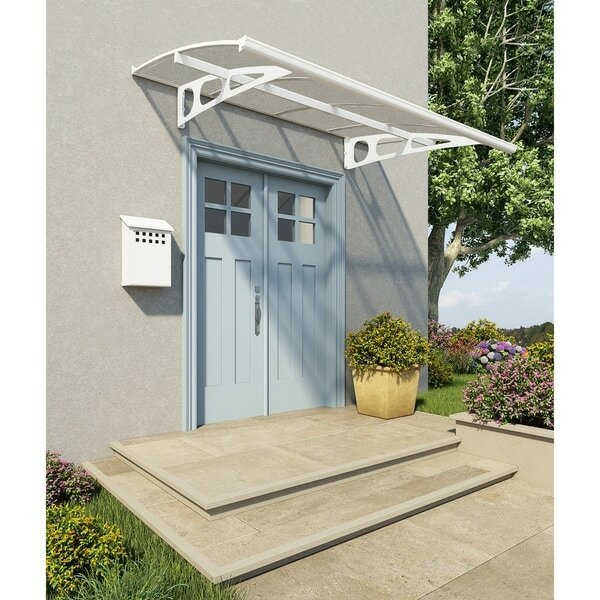 Decorate your entryway with an elegant, impressive & Extra-Large canopy. Protect your entryway, BBQ grill, bicycle from inclement weather, without blocking the view. High impact, 4 mm solid panels, naturally block 100% of the harmful UV rays. Front Aluminum gutter directs rainwater sideways. Hidden rubber gasket seals canopy to the wall surface - prevents water seepage. Laser cut, powder coated & Galvanized Steel support arms. Smart and fast locking assembly system allows fast, secure installation. Add value to your home or property and create an eco-friendly extension. No need to drill through the panel. Easy DIY assembly kit - includes installation hardware. Maintenance free design. Extendable product, no additional parts needed; use basic kit. Packaging fits a car's back seat. Dimensions 55.0 In. X 88.0 In. X 13.0 In. "What are the measurements of the awning?" Dimensions are- Assembled depth 54.7 in, height 13 in, width 88 in, minimum mounting height 13 in, mounting space required 88 in, height 13 in, length 88 in, width 54.7 in, projection from wall 54.7 in.